Only Charlie Chaplin could make a hit out of a silent movie after the transition to sound. City Lights was his first movie since talkies were invented. They had become the norm by 1929, but despite pressures to convert his flick to include audible dialogue, the star stuck to what he knew. Owning the studio helped Chaplin get his way and also gave him the freedom to do what he wished with his films and take his time in producing them. The movie is not without some sound of its own, however. It had a recorded soundtrack –composed by Chaplin– that also includes sound effects. Poking fun at talking pictures, Chaplin employed saxophones to stand in for the speaking voices of two characters who are unveiling a statue. When the Tramp swallows a whistle, the soundtrack includes the tweeting it makes with every breath. Gunshots and the bell at a boxing ring are also incorporated into the prerecorded sound. In City Lights, the Tramp constructs his adventure around a blind flower sales girl and a drunken millionaire. The man meets the girl (Virginia Cherrill) peddling flowers on the corner and is instantly in love. Later, the Tramp interrupts an “Eccentric Millionaire” (Harry Myers) as he prepares to drown himself. The Tramp tries to stop the drunken man from throwing in the river a large rock tied to a rope connected to the man’s neck. He fails and the two end up in the water and out and back in. Now fast friends, the Millionaire and Tramp return to the wealthy man’s home and do some additional drinking. When the morning arrives, they are still drunk and the man tells the Tramp he may have his car. He also provides him with $10 to buy flowers from his sweetheart. After buying out her stock, the Tramp drives the blind girl home, leading her to conclude he must be rich. When the girl becomes ill and unable to work, the Tramp secures a job to help make her well. He visits her regularly when her grandmother is not home, and one day discovers without a $22 payment, the women will be evicted from their home. The Tramp is able to secure $1,000 from his wealthy friend –who does not care for him when he is sober– but a snobbish butler (Allan Garcia), two thieves and the police send the Tramp on the run. The romantic nevertheless gets the money to his love and tells her to pay the rent and get her eyesight fixed with the remainder. He next goes to jail. The ending of City Lights is one of the most touching endings to a film in movie history. In quite the contrast to the comedy of the rest of the picture, I became a bit choked up at the sweetly romantic final moments. The girl, now seeing and running a flower shop, runs into the Tramp and recognizes him by the feel of his hands. Chaplin affects the most adorable visage as he nervously faces the love of his life after so long apart. He says “You can see now?” She responds, “Yes, I can see now.” The double meaning is all we get to assure us that the girl is not offput by the dilapidated duds worn by our hero. As the viewer, we find ourselves as nervous as the Tramp in wondering what she will think. Chaplin is a fantastic actor particularly in those closing, serious moments. All of a sudden the mood is changed and we’re grinning ear-to-ear for a reason other than laughter. The Tramp’s confidence is shattered outside the safety of the girl’s inability to see him, but his fictional wealth is no longer something she needs. Cherrill is even better than Chaplin. Throughout the picture she plays a convincing blind girl, but her power is shown best also in that end scene. She plays all the right emotions on her face so that we can understand what is occurring through the very little dialogue we have to explain it. Cherrill, unfortunately, did not make many more movies (but she married Cary Grant). I don’t think I need to tell you City Lights is also full of laughs. Chaplin uses his physical prowess to construct some terribly amusing scenes. Best of all is a perfectly choreographed boxing match during which the Tramp hides behind the referee. The Little Tramp has never looked so well kempt as when he is in uniform, but Charlie Chaplin‘s daring war comedy Shoulder Arms risked offending audiences at the time. Ready for release in 1918, World War I was not quite over and Chaplin was advised that audiences might not want to see him make light of the serious subject. Others said Americans needed the pick-me-up, and so Chaplin went through with the scheduled release on Oct. 20 that year. It was very well received. Forget the usual raggedy slouch pants and scruffy derby hat the Tramp usually wears, Chaplin’s character this time wears slightly oversized uniform pants and a jacket a size too small. His shoes are their usual oversized sort, and the helmet of “Doughboy” is not far from his usual chapeau either. Shoulder Arms opens on Doughboy in training and having a hard time holding his weapon properly or turning about face. He is often scolded by his superior officer for walking pigeon-toed, which naturally brings all the silliness possible to a march. Going for a nap, Doughboy next takes us to the trenches “over there.” A nice tracking shot follows Chaplin as he strolls obliviously through the trench and back, with explosions happening just behind him all the time –indicated audibly by a slide whistle and drum-cymbal crash. The troops have a decent underground bunk room where Doughboy sets up his back-scratching cheese grater and finds his feet might be too long for the bed. The bunk room is decent until the rain starts pouring in. By the time Doughboy gets leave to rest, his bed is underwater. This does not phase him as he fluffs his soaked pillow and pulls the submerged blankets over him. His snoring neighbor gets disrupted, however, when Doughboy’s annoyance at the noise results in a wave of water sloshing over the other soldier’s face. The rest of this 36-minute short includes Doughboy’s leaving the trenches for the field of battle –where he disguises himself as a tree– only to end up finding Edna Purviance’s character and taking refuge in her home. As can be expected of the tramp character, his bumbling ways result in his capturing the top German foe and delivering them to his superiors. I find it difficult to think of Charlie Chaplin as anything but a comedic actor, but one of his most notable films is in essence a drama. The Kid was the silent star’s first feature-length picture at one-hour in length. Associated First National Pictures was reluctant to let the moneymaker do a longer movie because it was making so much revenue off his quick-to-produce short subjects. The Kid proved highly successful, however, with Chaplin as writer, director, producer, star and score composer. An unwed mother (Edna Purviance) who is unable to care for her child leaves him in a car outside a mansion but is unaware a couple of hoodlums take off with the vehicle. When the men discover the screaming child in the back seat they leave him in a dingy alley where our hero, the Tramp (Chaplin), finds him. He initially tries to get rid of the baby, but ends up taking him home. Five years later the Tramp and the Kid (Jackie Coogan) have a great relationship working as scam artists. The Kid throws rocks to break windows, and the Tramp arrives just in time to offer the installation of new glass. They live in a run-down apartment in a run-down part of town but are obviously happy together. The Tramp turns out to be a fantastic caregiver who has not only educated his child to act as housekeeper and cook, but grooms the child somewhat like apes do. The mother has in the interim become a famous actress with plenty of money. She regrets abandoning her child and gives away toys to poor children in the Kid’s neighborhood, including to the Kid himself. When the boy becomes ill, the mother comes around to check on him and becomes involved in welfare services’ fight to put the boy in an orphanage. During her time in the Tramp’s home, she finds the note she left on her baby and makes the connection. She offers a reward for the boy’s recovery, and he is eventually taken from the Tramp and delivered to her. In the end, however, the woman adopts the Tramp as well. The Kid is marked by a variety of adventures shared by the Tramp and the Kid. The two are so in sync that despite their down-trodden lifestyle, we can see no better parent for the boy. Coogan dresses like his father figure with oversized, ragged pants and suspenders. The child actor really outshines Chaplin in many regards as his performance is so mature for his character. The actor was seven years old at the time of the film’s release, which makes his acting all the more impressive. Although The Kid is full of humorous moments, what will strike audience members the most are the dramatic efforts of the actors. Chaplin is admirable in the unlikely role of father and makes us feel the devotion with which he looks after his adopted son. The Kid is set for 6:30 a.m. ET April 16 on TCM. Certain members of the Classic Movie Blog Association are engaging in a game of classic actor Six Degrees of Separation by which we try to connect two seemingly unconnected stars through the other actors they have worked with (think of the Six Degrees of Kevin Bacon). 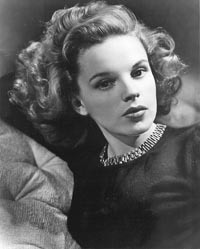 The group has moved through several rounds and has landed on Judy Garland and Olivia de Haviland. Dawn at Noir and Chick Flicks progressed the connection to Adolphe Menjou and chosen me to keep it going. Although I’m quite familiar with Judy Garland, I am less versed on both Menjou and de Haviland. Menjou engaged in a long list of films that go back into the silent era, but I have mostly seen him in supporting roles, and his work therefore registers less easily. De Haviland has never been an overt favorite of mine, so I have not pursued many of her films. Thanks to the handy dandy Internet, however, I discovered that Menjou and de Haviland appeared in a movie together: The Ambassador’s Daughter from 1956. Being that I have completed the connection between Garland and de Haviland (It went Garland and Deana Durbin in Every Sunday to Durbin and Menjou in One Hundred Men and a Girl to The Ambassador’s Daughter. ), it is now my duty to choose the next pair of stars other bloggers will now have to connect. To make it challenging I’ll select Grace Kelly who only made 14 films and challenge Becky at Classic Becky’s Brain Food to connect the princess to Charlie Chaplin. Good Luck! Life is rough for the Tramp, but perhaps some of his follies can be blamed on his excessive drinking. Charlie Chaplin in his first year making movies subjected his star character to a lot of bar time. In the short Mabel’s Married Life, Chaplin collaborated with Mabel Normand in writing and directing one of a handful of flicks that year that dealt with the predicaments of “Mabel”. Mabel and the Tramp get mixed up with another couple in this one as the bulky spouse of another makes advances toward Mabel while her husband is stealing booze at a bar. When the Tramp returns to find the two together, he punches the man in the dusty rear several times but gets no attention. He eventually dukes it out with the bloke but is already worse for the wear. Later, to get back at her husband, Mabel purchases a mannequin and positions it inside their apartment so her drunk spouse will mistake it for another man. Although it takes a few minutes, the Tramp does eventually notice the “man” and finds himself berated by the wobbling dummy that once pushed comes careening back towards its foe. The situation becomes increasingly absurd as Mabel joins the argument and finds herself knocked about by the dummy. The next short, Face on the Barroom Floor, was a difficult-to-follow tale of a man who spends half his time staggeringly drunk in a bar and the other half in his flat painting subjects. The best I can tell is that one man whose portrait he is constructing meets in passing the artist’s next subject, a lovely woman. The two eventually take off together and we learn that the woman was the Tramp’s girlfriend. The most comical moments for me are the Tramp’s instances of oblivion with regard to his paintbrush. Coated in black paint, the man taps it against his chest, marking up his white suit shirt, or puts it in his mouth thoughtfully as though a pencil before realizing he’s just painted his tongue. Having watched a handful of Buster Keaton movies recently, I cannot help but note the differences between that silent comedian and Chaplin. Unlike old stone face, Chaplin was wonderfully expressive, as was necessary with these shorts that had an abject lack of intertitles to explain the circumstances. His wonderful “tramp” style is particularly emphasized in Mabel’s Married Life as barmates mess with his tie and jostle his oversized trousers. With all the experience he got in 1914 making an almost endless number of shorts, Chaplin certainly had his style down to a science. To watch YouTube videos of the short movies, click on the related photos. Perhaps coming off a Marx Brothers picture had me ill prepared to enjoy my first Laurel and Hardy shorts or maybe the duo is just not my cup of tea. I caught Thicker Than Water and The Fixer Uppers among the marathon of Laurel and Hardy movies and shorts TCM aired last night as part of its month-long tribute to Hal Roach Studios. I have a few more shorts and feature films recorded, so expect those reviews at some point in the future. As mentioned, I had not yet seen a Laurel and Hardy picture, and like the Marx Brothers and Charlie Chaplin, the duo was not a comedy standby I ever had any interest in. But for perhaps no other reason than this blog, I have developed a desire to expand my historical film knowledge and have concluded my expertise would be considerably curtailed if I declined to enjoy these classics. Although I found the pursuit of Marx Brothers and Chaplin movies quite rewarding, I was a bit less-than-jazzed when watching these Laurel and Hardy shorts. Although their bits reminded me some of the Three Stooges, with whose films I have plenty of experience, they were otherwise fairly bland. 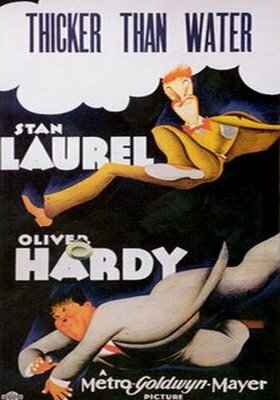 In Thicker than Water, which was the last short the two did before making exclusively feature-length films, Stan Laurel suggests Oliver Hardy withdraw the $300 in his joint bank account he shares with his wife in order to pay off their furniture and eliminate debt collectors from his life. After a firm “no” from his wife, Hardy indeed takes the money with the intent of buying new furniture. He stops by an auction where a woman asks him to keep the bidding for a clock open until she can retrieve her money from home. After Laurel bids against Hardy and drives the price up to $290, the auction closes and the man is stuck paying for the grandfather clock. On the way home the clock is predictably destroyed when run over by a truck. What was fun about this episode is that when Hardy’s wife bashes him about the head with a frying pan, Laurel is forced to give his pal some blood at the hospital. A problem with the procedure results in the swapping back and forth of fluids, and the end result is Laurel “becoming” Hardy and vice versa. It was fun to see how each interpreted the other’s personality. The Fixer Uppers was on the same plain with Thicker than Water. When selling holiday cards, the two meet a distraught woman upset because her husband does not seem to care for her as he used to. Laurel proposes she make him jealous by being seen with another man. Hardy volunteers for the job, which heads for disaster when the husband, the best marksman in France, challenges him to a duel. Later, a mixup in identity results in police delivering the passed-out-drunk Laurel and Hardy to the home of the man set on ending Hardy’s life, and the two must find a way to escape with their lives. The shorts featured the physical comedy I recognize from the Stooges –or I should say: that the Stooges would later employ– such as the dropping of dishes by Hardy after Laurel sets them on an ignited stove burner. Hardy, at least, seems thoroughly superior intellectually to the Stooges while Laurel is mellowly dimwitted. I would not say Stan and Ollie are not funny, but their gags were relatively lost on me. Perhaps their full-length films will tickle me better.